Every mom has said it. And we’ve probably said it more times – in a day – than we can count. Fear not, mamas. We come to the rescue with a vegan recipe modified here and there to make a baby-pleasing, portable, healthy and delectable meal. What makes the Pumpkin Pie Pancakes vegan-ish? You can switch out the cow’s milk for a cup of vanilla soy milk as in the original recipe. We like this vegan-ish recipe for the under-1-year crowd since egg whites are a potential allergen, making most pancake recipes off limits. For the over-1-year crowd, these Applesauce Pancakes we got from our mom pal, Julie, are pretty darn fabulous. Makes about 16 silver-dollar-sized pancakes. If serving all pancakes immediately, heat oven to 170 degrees and cover a baking sheet with foil. Take out two medium-sized bowls. If you have batter bowls or giant measuring cups, use those. In one bowl, mix the dry ingredients (flours, sugar, baking powder, salt, pumpkin pie spice). In the other bowl, combine milk, canned pumpkin and canola oil. Pour the wet ingredients into the dry (see where the batter bowl comes in handy now?) and stir until just combined. Heat a nonstick skillet to medium and grease lightly with butter or cooking spray. The size of the pancake is up to you, so ladle your batter onto the skillet. Once the top of the batter starts to bubble, flip the pancake and cook the other side. Repeat. Repeat. Repeat. Repeat. Well, you get the idea. Keep pancakes warm on the baking sheet in the oven. Serve the pancakes immediately topped with fruit or a bit of local honey. You can also freeze the pancakes individually or in sets of two or three to easily pop into the diaper bag for meals on the go. 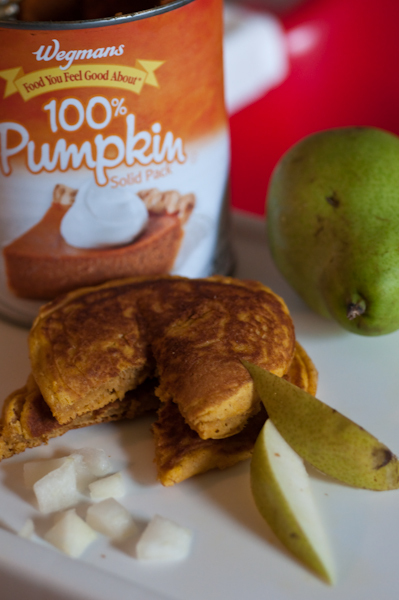 Using canned pumpkin bumps up the nutritional value of these pancakes and, if used on the go, they make for a much better alternative to many packaged snacks. What’s your favorite on-the-go snack or meal for your wee ones? Pumpkin makes the most divine pancakes! I’ve been known to sub vanilla protein powder for the flour. Delish! No eggs and soy milk vegan pancakes – love it! Can’t wait to try. Thanks for the recipe.